The names that are almost synonymous with the word “Hollywood” are Lucas, Bay, Tarantino, and Spielberg to name a few. 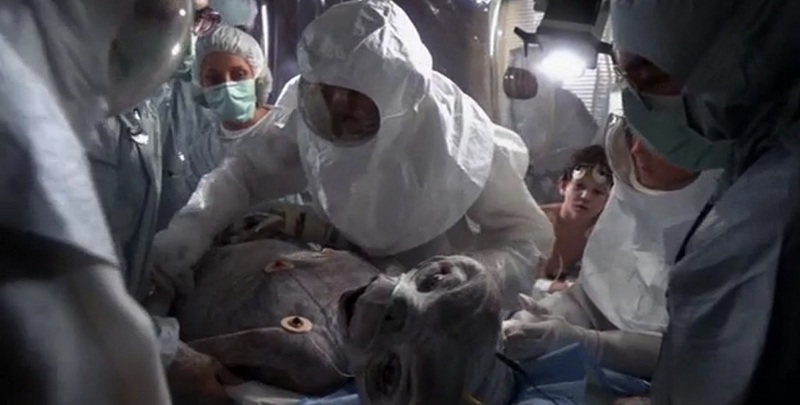 Spielberg in particular has a fascination with exploring interactions with alien subjects… as in, literal aliens. From his earlier work with Close Encounters of the Third Kind to his most recent Indianna Jones instalment, he has a philia for all things xenos. E.T. The Extraterrestrial fits into his passions quite well and is an unusual combination of a science fiction children’s film. After phoning home, I waltzed on down to the In the House screening of the film to see how this classic by maestro of the cinematic medium faired on the big screen. The MCs for the evening were Jason ‘Jabba’ Davis and David ‘Quinny’ Quinn. After playing ‘rock, paper, scissors’ with the entire audience, a hallmark of the In the House experience, the two shared some interesting trivia about the film. 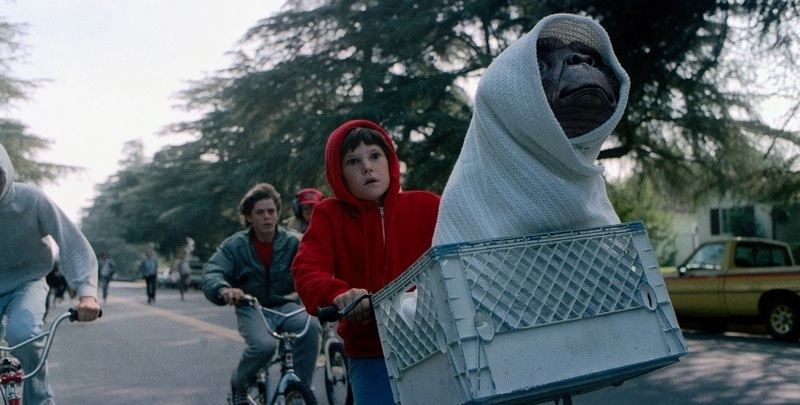 The thing that stuck out in my memory was the fact that Spielberg came up with the idea for E.T. while wandering off the set of Raiders of the Lost Ark and reminiscing in the Tunisian desert. Apparently, his original concept of an alien befriending a young boy was one he developed in his youth as a way to deal with the divorce of his parents. I feel the relationship of E.T. 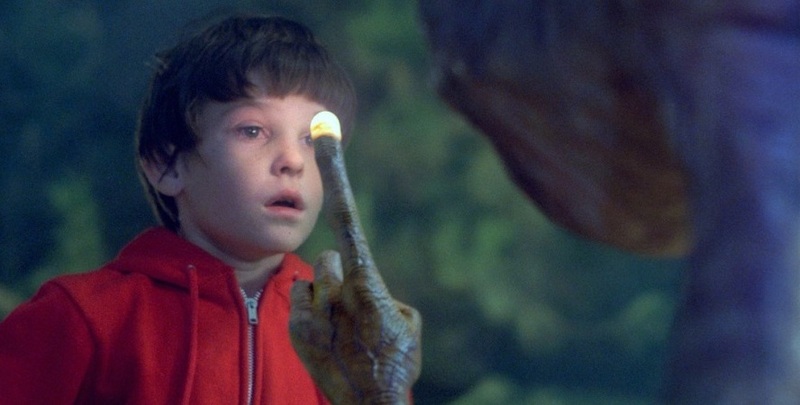 and Elliot in the film takes on a new dimension when you factor in that even before this film was made, E.T. was already helping someone with their pain. The film starts us off with a group of aliens exploring a wooded area of rural America before being interrupted by a search party of men. The aliens leave in haste but leave one of their own behind who escapes the search party and runs to hide in the suburbs of a nearby city. Meanwhile, in a house in the suburbs, Elliott (Henry Thomas) encounters the alien in the shed in his backyard, who he names E.T. After a misstep or two, both Elliott and the alien become friends. 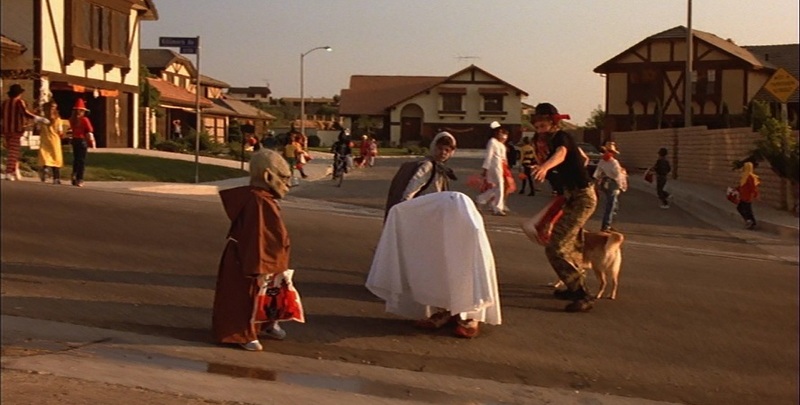 The pair must work together to help ET get home and escape the attentions of the adults who wish to stop him for their own ends. The story is simple enough to follow without too much complexity or ambiguity. Everything’s pretty straightforward and it works to reinforce the sense of childlike simplicity with which Elliot approaches E.T. There is no real examination or reflection of E.T. as anything other than a really cool friend to have and play with by pretty much all of the young characters in this film. The one exception to this is Elliot’s mother, Mary (Dee Wallace), who we see at multiple times during the film going through the emotional turmoil of a difficult divorce. 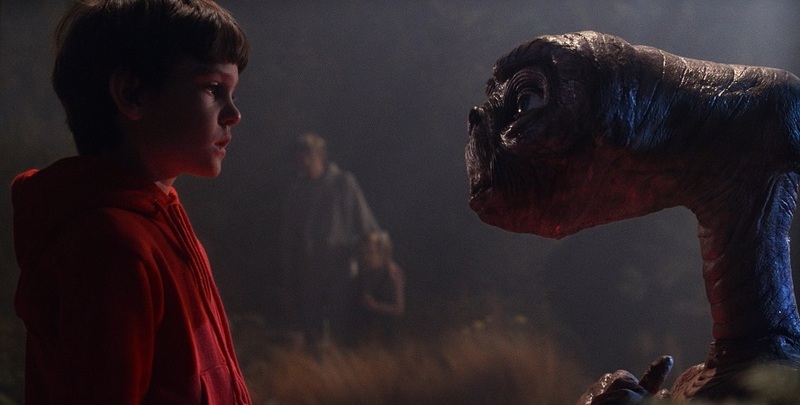 The main crux of the film is the relationship between Elliot and E.T. and the film asks a lot of its child star to make its entire concept work. Luckily, Thomas is able to deliver and we really get the sense of connection and love between the human and alien characters. He’s also not, thankfully, an insufferable character which speaks to the strength of the screenwriter who has worked to create a personality who is both likeable but distinctly childlike. Elliot is naïve and goodhearted but not an idiot, as so often screenwriters imagine children to be (and which can drain the charm out of them fast). The simplicity of this film’s interpretation of the events and characters is incredibly straightforward and makes it a film wholly suitable for a younger audience… however, this can also make things a bit slow in parts. I mean, it pains me to say it but I was honestly a little bit bored at points in the film. Everything is so straightforward that it really just couldn’t hold my attention. It wasn’t enough for me to wish that the XCOM project finally make an explosive entrance and take E.T. in for questioning but I was certainly yearning for some of the meatier fair of Spielberg’s Close Encounters of the Third Kind. It’s not something which will ruin a first watch of the film or for younger audiences but it left me wishing for more. The cinematography in so much of the film is absolutely beautiful. The night time shots of the shed in the first act of the film are beautifully composed with the humdrum of a suburban backyard taking on a beautiful but menacing form as the light spills out through the doorway. Another aspect you’ll notice is that much of the film’s shots are filmed from a low angle. It works to replicate the feeling of looking up at adults when you’re a young child and I feel it works well to put us in the mindset of Elliot. A lot of Spielberg’s work is absolutely timeless movie magic that will continue to surprise and delight film goers for generations to come but the same can’t be said of the special effects. Don’t get me wrong, the E.T. puppetry and animatronics still look great and hold their own against today’s CGI but some of the other special effects hasn’t aged well. In particular, scenes where characters or things fly really doesn’t hold as well as other parts. It may be somewhat jarring for modern audiences, but I’m willing to bet that kids are going to be too enamoured by the story of children and their alien friend to really care. The film is brilliantly scored by Spielberg collaborator John Williams who is an expert at working a symphonic score. Williams creates a soundscape which is wonderfully captures and highlights the mood of the film’s emotional beats. When we first meet E.T., it’s tense as we don’t yet know what to make of the alien creature but quickly Williams turned everything around. The soundtrack takes on a lighter tone with plenty of strings to carry the them and ultimately crescendo during the film’s iconic chase with horns and percussion. It’s a showcase in how classic film scores can stand the test of time. So overall, I very much enjoyed this film and was happy to see it on the big screen. The story sells itself on our childlike desire to connect with others and the chemistry between our protagonists in undeniably charming. The cinematography is breathtaking although some of the special effects may not have aged gracefully in the face of modern day CGI. The soundtrack is an exemplar of classic Hollywood film scoring with work that stands the test of time. It was a fine film to watch and I’m glad to have been invited along to come see it. Kudos to In the House for screening such a classic! E.T. 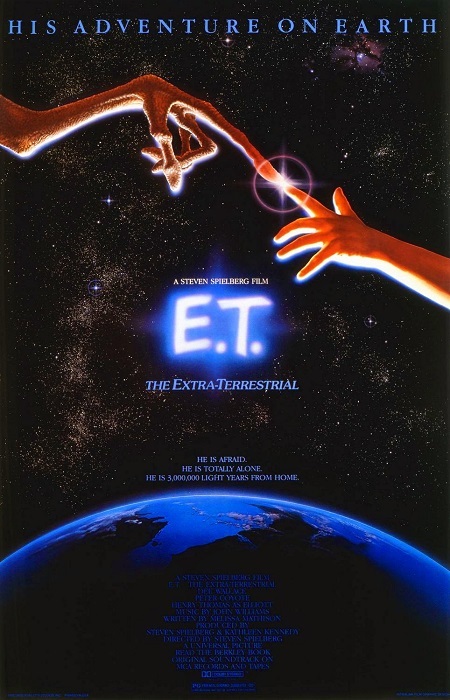 The Extra-Terrestrial is a classic children's movie about a friendly alien visiting Earth.